Nokia needs a swift injection of relevance — badly. Compared to Google’s and Apple’s mobile OS offerings, Nokia’s Symbian software is positively prehistoric. And Nokia phones overall are little more than handheld curiosities, at least in the U.S. consumer market. But we’re finally seeing hard evidence of a much-needed sea change at Nokia. This Tuesday, screenshots of three new Nokia devices running the Windows Phone OS — the first of many promised devices to run the software — finally surfaced. 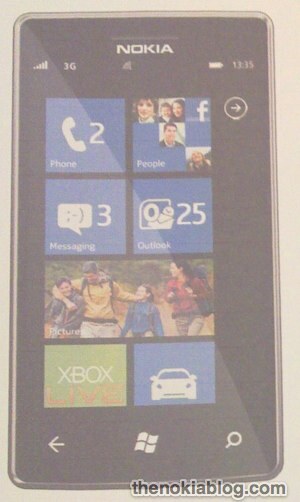 The phones will most likely make their official debut on Wednesday morning at the Nokia World conference in London. WinRumors was the first to report the story. From what we can tell, the Nokia Lumia 800 looks exactly like the N9 model we played with earlier this month, save for the fact it’s no longer running the Linux-based Meego operating system. 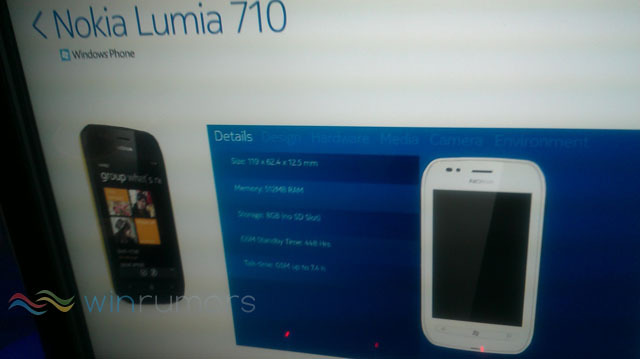 The companion Lumia 710 smartphone differs aesthetically from the 800 in that it’s less boxy, instead boasting rounded edges and a flat-looking face. According to details in the leaked images, the phones both come with 512MB of RAM and no SD card slots. Further details are scant. Additionally, The Nokia Blog received a spec sheet for a third device, the Nokia 900. With a 4.3-inch display and a 1.4 GHz Snapdragon processor backed by a gig of RAM, the 900 looks to be the star of Nokia’s show. Once considered the smartphone market leader, Nokia’s industry cred has flagged over the past few years as the company has failed to sufficiently update its Symbian operating system. Though Nokia shipped upwards of 450 million handsets in 2010, its marketshare dwindled by almost 7 percent last year. Meanwhile, user adoption of Android and iOS continues to skyrocket. Nokia is betting its future on Microsoft’s mobile OS. Earlier this year, Nokia made a major deal with Microsoft to transition from the antiquated Symbian software to Microsoft’s Windows Phone OS. We’ll be on site at Nokia’s Northern California offices on Wednesday for the official announcement.